Mojito Mint is the mint, Mentha x villosa, used to make the Authentic Cuban Mojito drink. A simple drink to make that looks impressive and great for spring and summer entertaining. This mild scented mint can be used in fruit salads as well as potpourri. Best when used fresh but leaves can be dried and stored in airtight containers with little flavor loss. As with most mints, the Mojito mint plant can be invasive if not corralled properly, so plant it in a container with a 2 inch recessed rim so the plant doesn't creep out onto the ground. Draping outside the container is fine, but it shouldn't touch the ground. Move the pot around to different areas of your garden to add subtle impact and fragrance. The Mojito Mint can be a wonderfully fragrant addition to any garden if planted in containers. Matures in the 18 to 24 inch height range. Space plants every 12 to 16 inches. View our Easy to Make Mint Mojito Mint Drink Video below. In a tall narrow glass, place the leaves, lime juice and powdered sugar. Mash ingredients with the back of a long spoon. Add ice and rum, mix. 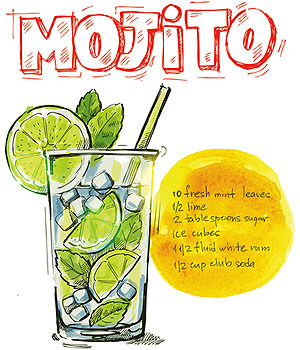 Pour in club soda, garnish with mint sprigs and lime slices and serve. Mojito Mint ships in 3.5 inch pots.